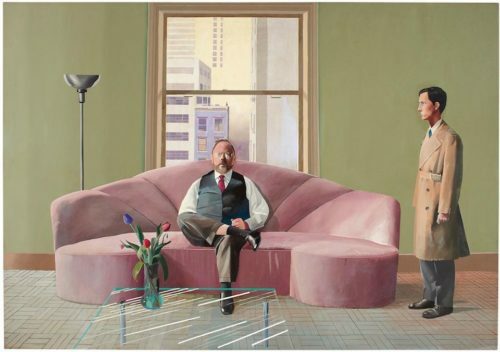 A painting by out gay artist David Hockney is expected to fetch a whopping $38 million at auction early next year. The portrait features Metropolitan Museum of Art curator Henry Geldzahler and his then-boyfriend, painter Christopher Scott. The painting is part of a series of massive portraits Hockney created in the 1960s and 70s. Each painting features two subjects who are pointedly not looking at each other. Hockney visited Geldzahler’s Manhattan apartment in the late 60s and took polaroid photos of the two men and the view out the window from the apartment. Using the photographs as inspiration, Hockney became obsessed with the painting and spent days working on it nonstop. Geldzahler, sitting on an art deco couch, stares straight at the viewer while Scott, facing left, stares ahead showing only his profile. Geldzahler who was friends with many of the artists he appreciated, met Hockney at Andy Warhol’s Factory in the early 60s and the two became fast friends.